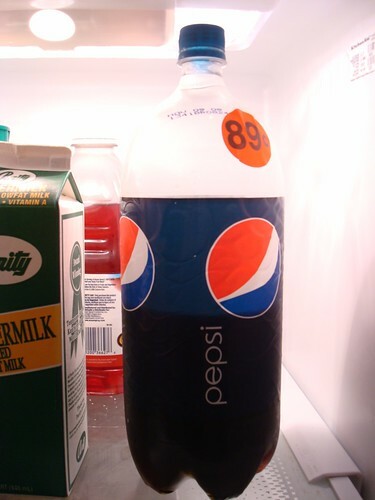 My love affair with Pepsi began in high school. I'm afraid I'm one of those soda snobs who can not only tell the difference but will ask the waitstaff which they serve and change my order accordingly. Over the years my intake has varied but for the past few it has been steady and consistent--one can a day, at lunch. Too much earlier makes me ill. Too much later leaves me wired. Only...it's empty calories that I don't really need. And with a desk job and no exercise plan to speak of, that's something I can do without. And often it seems that I drink my lunchtime Pepsi simply because I always do rather than because it's what I really want. So I am taking a break. I told myself I would step down from one can a day to one a week (having learned long ago that total denial rarely works). Well it's been one week and the only soda I've had is a few sips at the movie theater on Friday. Instead of soda, I've been drinking mostly water and some tea (when my hubby doesn't finish it off first!). Oddly enough, my sweet tooth seems to be increasing in proportion to the missing sugar, so I'll have to keep an eye on that. I've been getting enough sleep, so I'm not missing the afternoon pick me up from the caffeine, but I'm sure I will eventually. I'm competitive enough that I want to see how long I can keep a soda free streak going for. Who knows perhaps this time will be the time that sticks. (I went over a month without any soda a few years ago simply because I didn't feel like having any.) In the meantime, I'm relying on my hubby to finish the open 2 Liter in the fridge.